I know. Sounds crazy - right? I prefer answers to my unanswered prayers. We all have them. Some big. Some small(er). We're all looking for the answer we desire. The goodness of restored joy....restored vitality of life. We can't help ourselves, our hearts ache to believe in such things. I've heard from a couple of my readers in the last couple weeks. They are worried about me after reading my last post, "Even If You Don't". Have I given up? Have I lost my faith? Why on earth would I write about the other side of the coin? That awful "tail-side" face of doubt. Unfortunately, I am so ridiculously human that this journey sometimes gets the best of me. I felt led to share my weakness. There are so many reasons why Bart Millard's testimony was comforting to me. Hearing him speak about his son's chronic medical issues makes me feel less alone. I love his honesty about his struggles and I thought you would too. Funny thing is......I've given up so many times on this crazy idea of mine.....that Olivia would be restored. But inevitably, I'm always drawn back to Hope again. It's like I get lassoed by an invisible rope that holds me tight and won't let me go. The idea that I could simply wiggle out of the loop escapes me as I allow the tightening to commence. The gentle tugging from despair's darkness into the light of day is a rescue that never gets old. Deep down I know I don't want to break free, unbelief is lonely and can present itself in so many ugly ways. Daylight feels safer. It never fails. Each and every time I'm drawn in close, I receive some sort of revelation to my situation. In this particular instance, I came across a sermon from Bill Johnson at Bethel Church in Redding California entitled "Answer's Matter", and it reignited my hope for Olivia. This sermon provided me with so many nuggets of truth. Bill explains that "prayers without answers are pointless and that complacency and ignorance tolerate unanswered prayers. He went on to say that we were not designed for unanswered prayers.....that’s why there is no instruction for it in the Bible. There can be a delay, there can be room for a process, but we were not designed to coexist with unfulfilled prayers. We are made to co-labor with God to help release His will and purposes for our lives on this earth." Say what? Just what I needed to hear. Just when I tried to give up for the 100th time, I immediately feel the tugging of the rope from these life-giving words. So much to unpack from the first five minutes. Complacency. Ignorance. Co-labor. Merriam Webster defines complacency as "marked by self-satisfaction especially when accompanied by unawareness of actual dangers or deficiencies". Is that my problem? As I dove in and studied related words other negative synonyms popped up, like conceitedness, ego, egotism, pride, pridefulness, self-admiration, self-assumption, self-conceit, self-glory, self-importance, self-love, self-opinion, self-satisfaction, smugness, vainness, vanity. And here I thought it just meant being lazy and unmotivated. Can this be true of me? Complacency can and does become a heart thing when you are alone in a fight for such a long period of time. You begin to rely on you. After several years, most family and friends moved on with their lives while my heart remained the same.....broken. I couldn't shake my one objective....to save Olivia. And herein lies what could be my complacency. Pride, self-opinion and ego trump the real Savior. What's equally enlightening is that I can have this misplaced pride while experiencing the feelings which are the exact opposite.......words like self-loathing, self-doubt, timidness, passivity and shame. I didn't protect her. No wonder I feel like my prayers for wisdom go unheard. It's like these words....these feelings are a pack of wolves chasing me here, then there.....always towards the darkness, not the light. Words like should've and could've dominate the night. Ignorance, on the other hand, shouldn't be my problem. From day one of this nightmare, I've taken her to every "expert" physician I hear about within driving distance. Aren't we taught that experts lack ignorance? It's kind of why they are experts - right? So many hours waiting to see each and every one of them. They all have given me zilch. How is it that she can become so incredibly weak, to the point of being hospitalized, and all the tests come back normal? Is she a mystery or could their tests be wrong? Could it be that my ignorance is that I've relied on ignorance for 17 years? Even though God is known as The Great Physician, my reliance has always been on the physician with "skin on". I've been told over and over that God works through doctors. Not always. I guess I forgot the full meaning of Matthew 6:33 But seek first the kingdom of God and His righteousness, and all these things shall be added to you. This sermon reminded me of truth. Every. Single. Time. Jesus ministered to someone, he brought deliverance. I was reminded of Matthew 4:24 "News about Him spread all over Syria, and people brought to Him all who were ill with various diseases, those suffering acute pain, the demon-possessed, those having seizures, and the paralyzed--and He healed them." The disciples became experts in Jesus's healing ministry. They were walking alongside Him, healing people left and right. Jesus even says, "I saw Satan fall like lightning from Heaven", in Luke 10:17-20. There is just one instance they were not to bring healing, that of the epileptic boy. Does this verse sound familiar to those who have followed my journey this far? I have written about this Bible story so many times. I've even gone as far as to say that Olivia and I are the Mother/Daughter version of this Father/Son journey. You can read my older posts on this scripture here, here, here & here. Needless to say, I've gotten some mileage out of meditating on this story. To refresh your memory, the story is about a father, whose son has been having seizures since childhood. He has spent years trying to help his son. He hears about the disciples and takes him to them, but they are unable to heal him. The disciples do not understand why they are not able to free the child, and therefore brings him straight to Jesus. 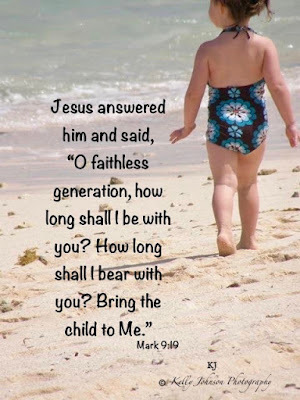 He chastises the father and disciples about their lack of faith and delivers the child. Read the full story here (Mark 9:17-29). Olivia's doctors remind me of the disciple's and their efforts to free the child. Doctors are accustomed to helping people as did the disciples. For Olivia, they never had an explanation on hand. For years and years, the dogma recited was.......you guessed it........it's genetic (which recent extensive genetic testing obliterated). It's Olivia's fault and in 20-40 years science will have an explanation. As Bill explains, the disciple's reaction to the mystery of their failure is the exact opposite. They were unsatisfied with the result. They had to know why they were not successful, so they went to Jesus. What they didn’t do was create a theology around what didn’t work, as to say, this is ok."
That darn pride exists everywhere......even in the conventional medical system, where complacency runs rampant for the patient who doesn't respond appropriately. I've made the rounds to all the experts in every field, including the religious arena. Most of the spiritual "experts" (i.e. Pastors) I've met with were extremely thoughtful and caring people, but none were ever bold enough to stick it out with me. Friends continue to support me as much as they can, although 17 years is a long time to believe for something. I was struck by Bill's candidness when it comes to supporting people with unanswered prayers. He says, "In our attempts to comfort people in loss, we tend to create untrue places of safety, untrue tenants of faith, and untrue doctrines that make unanswered prayers ok. I can’t look for answers that keep me comfortable in the middle of a mystery when it’s supposed to aggravate me to a breakthrough. Some things are not supposed to be comforting some things are supposed to be provoking. Some things are just simply to summoned me out of what would be a complacency because complacency and/or ignorance tolerates unanswered prayers." Even if the night is long, I'm reminded that He's in the waiting.